Meet Genevieve! My trusty dress form who allows me to drape all kinds of apparel, both in progress and finished, over her shoulders, around her neck and waist. She doesn’t seem to mind. She was a birthday gift a few years ago from my husband. My mom asked if she was the grownup version of the dolls I made and played with for years as a child. Yep! Here she’s dressed in Dreamy Poncho, a design of my own. If you knit, you can find the pattern here in my new online pattern shop. This knitted poncho is so much fun because of all the color choices you can make. Picking and combining skeins of yarn is, for me, the most exciting part of beginning a new yarn project. For some, it may seem a bit daunting. But never fear! For those who are skittish when it comes to choosing yarn colors and textures, I have a free article for you to download. The poncho can be worn a couple of ways, and knitted with or without the collar. Recently, Genevieve has been alternating between wearing a knitted shrug and a knitted wrap…two designs I plan to have out in the next week or so. She has also enjoyed getting outside in the beautiful fall weather and enjoying being amongst the lovely colors, which I fear may not be around too much longer. I’m glad we have yarn and paint to continue the color feast, even in the months of evergreens and bare trees. What a fun drawing! Now I want to name my dress form, too! Oh my, Please do keep us in the loop about Genevieve. Her likes, dislikes, comings and goings! Always wonderful to make new friends. Ha! 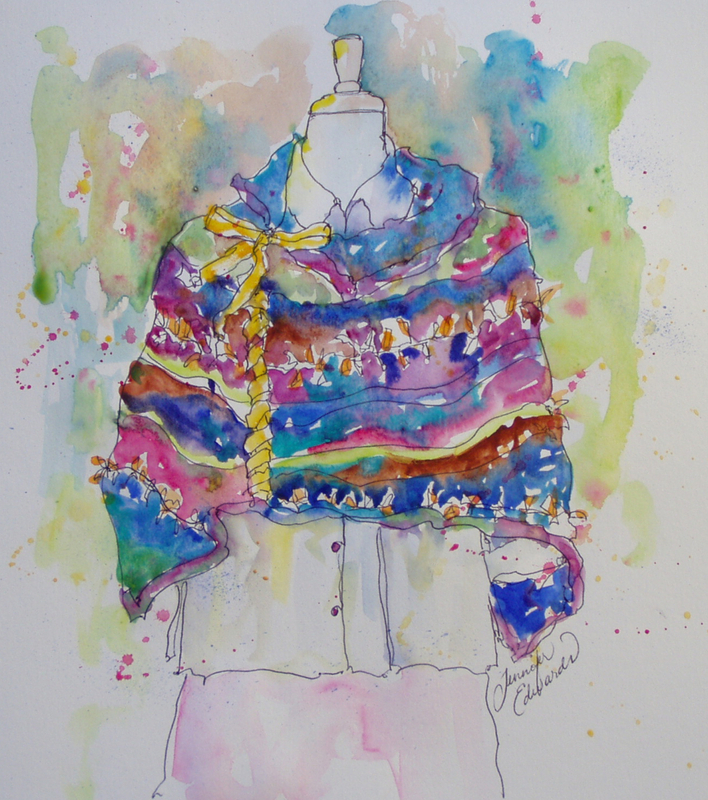 I can’t decide which I like more – the poncho or the sketch of the poncho. They both are gorgeous. I love the colors and the painting. Really awesome use of watercolor. Your design of poncho and art is wonderful. Your style is lucious – both the sketch and the poncho! My Lola needs a poncho too ! !